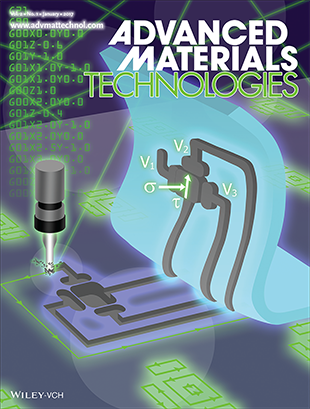 Research by University of Maryland (UMD) alumni Alexi Charalambides (Ph.D. '16) and Professor Sarah Bergbreiter (ME/ISR) has been featured on the January 2017 cover of Advanced Materials Technologies. Their paper, Tactile Sensors: Rapid Manufacturing of Mechanoreceptive Skins for Slip Detection in Robotic Grasping, "presents a rapid manufacturing process using computerized numerical control (CNC) milling to create a “robot skin” with normal and shear force tactile sensing." According to the article abstract "the robot skin is made entirely of elastomer and contains tactile pixels with microscale features distributed over a large area. Using this approach, the robot skin is integrated with a 1 degree-off-freedom gripper for closed-loop grasping and slip detection." Charalambides worked with Bergbreiter in the Maryland Microrobotics Laboratory during his Ph.D. studies at UMD. He is now a post-doc in Carnegie Mellon University's Integrated Soft Materials Laboratory. Advanced Materials Technologies, a Wiley Publication, features technology-related materials applications research, with particular focus on advanced device design, fabrication and integration, as well as new technologies based on novel materials, and bridges the gap between fundamental laboratory research and industry.